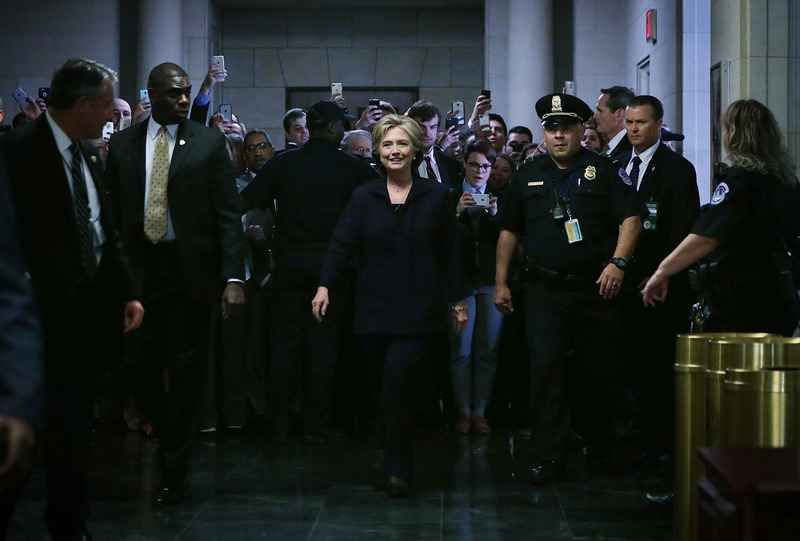 On Thursday, former Secretary of State Hillary Clinton will testify for the second time about the Benghazi attacks, in front of the Republican-dominated House Select Committee on Benghazi. Though independent investigations have disproved accusations that the Obama administration didn't respond to intelligence warnings before the attacks and then covered up their wrongdoing, inquiries have still dragged on. Even the Benghazi committee's Twitter account makes it look like a political attack against Clinton instead of a real investigation. Think Progress released two charts Thursday which show that the attacks on Benghazi have resulted in more congressional committees and congressional hearings than any other high-profile terror attack — including the attacks of Sept. 11, 2001. This is strange, because independent investigations have already cleared both the government and Clinton, whose use of a private email server during her time as secretary of state was thought to have covered something up. The committee has been criticized as seeming more like a "witch hunt" designed to hurt Clinton's presidential run than any real investigation into some greater government wrongdoing. One look at the Benghazi committee's Twitter gives such allegations a bit of clout. If you scroll all the way back to March, the tweets are heavily focused on Clinton's emails. There was only one tweet in February, and tweets from January (at the beginning of the investigation) actually talk about things unrelated to Clinton. But in March, the tweets are heavily — if not entirely — focused on Clinton's emails. They continue with that general theme until mid-September, when the account goes quiet for about two weeks, following House Majority Leader Kevin McCarthy's comment that the committee was being used in part to damage Clinton's presidential campaign. When the tweets resume in October, they are yet again talking about Clinton's emails. Recently, the tweets have brought up emails from Ambassador to Libya Chris Stevens (who was killed in the attacks) to the State Department, which were apparently requesting more security in Libya. But on Thursday, the tweets seemed defensive. Last week, Rep. Richard Hanna, a Republican from New York, said that part of the investigation was the routine evaluation of whether the government did something wrong, but another large part was to "go after people and an individual, Hillary Clinton." The fact that Clinton's emails dominate the committee's Twitter account makes that allegation more believable.